hi Veg!! I love your blog so much!!!! and I like to read about School`s dinner all round the World!! If you don`t find Araraquara in the Globe, don`t fell bad!! LOL. I am also a Brazilian and don`t even know where it is!! LOL. I guess Sao Pauo!!! I admire you so much Veg!!! Welcome CJ, it sounds like we're in for a mini tour this week with all your dining options on campus! I like the look of your plate of fruit. The price seems quite high though, presumably your campus eateries are run as straight commercial enterprises. I can't believe the price of Edmilson's meal - wow! Howdy, welcome to the world of NeverSeconds and a great first blog. Looking forward to the rest of the week, and weren't we spoiled today. Dear CJ, It's interesting that you rate your meal 9/10 for healthiness and the Brazilian person rates theirs 8/10. Shows how subjective that 'health' description is. I don't mean to be offensive, but I think actually your meal looks pretty unhealthy - and not sustaining enough for a growing kid. The fruit salad should be the 'sweet' and you should ditch the chips (we call em crisps)for something sustaining, like the pulses that the Brazilian has - or some lean meat and rice or something. The Coke (I know you didn't drink it, but it's in the picture) is definitely not healthy, even if it's low cal. And the BIG cake! ! I'd give the meal 3/10 for healthiness. Be interesting to see what rating an official from the Scottish or English Govt would say about it. Keep it up, though. 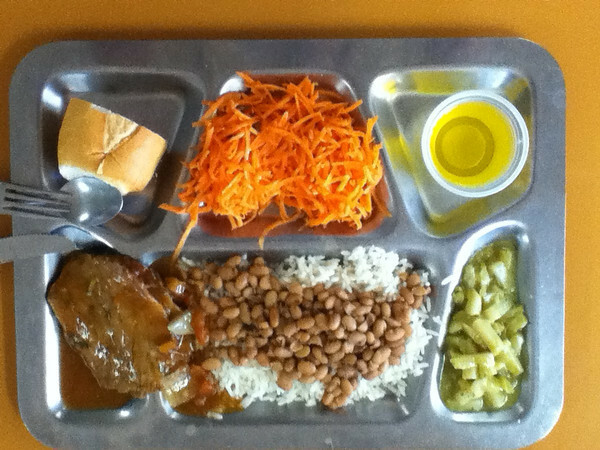 Really interesting to see meals from around the world. She's not a growing kid, but a graduate student.. in her 20s. So her lunch choices are even more shocking. At that age, you should know better. IMO only 6 year old kids should feel full after 10 pieces of chips and 25 pieces of melons and grapes. 1 second... but we live in Fort Worth, TX so it was pretty easy to find you, CJ! Hi VEG, hi CJ and hi Edmilson! VEG, you're an awesome kid and I just love your blog! Best regards from Minas Gerais, Brazil! Welcome CJ and Edmilson. Araraquara - 8 seconds! I Wiki-d it. Is that cheating or just using your resources. Anyway, both meals look great. Edmilson's is a steal at the price and the food is not only plentiful but looks to be of good quality for what he's paying. WOW. CJ - even in Canada I don't think our prices are that high. Vending machine prices? I'd have to cut back to the fruit salad and the brownie to save money. Was the water free? The reports were worth the wait. Great fun. Roll on the rest of the week! I'm so happy to see a meal of my country, of my State. <3 Brazil, São Paulo. Rice with beans is the best and healthiest food ever. CJ, I cannot believe you had to pay $9.00 for that little bit of food! Hi CJ! I was so excited to see your post today- I did my undergrad at Texas Tech and I'm currently living in Illinois! I do not miss that expensive dining hall and Student Union food haha... I do remember there was a meal I always enjoyed from a place in the Union (maybe it was a Sam's place?) It was near the post office if everything has stayed the same since '10. They had a build your own burrito bowl and the rice and the cilantro dressing were so good! I would love to know what you're studying! Lubock (0 seconds I saw the Buddy Holly story the other week). Your food doesn't look either healthy or good value. I wonder if it is possible to eat a meal that isn't processed (or includes processed sugar). Having seen the meals served in UK schools I would replace the dessert with a piece of fruit and the drink should be water. It's a cheap and healthy option. Perhaps there should be pudding on Fridays only. Your food looks healthier and is definitely better value. VeG The power of this blog is that we can see how some countries still care about the food they eat. Sorry about the lecture, but it's got to be said! CJ, I too live in Lubbock, but am not a University student. However, you must be the "typical" student as that lunch is totally not healthy, hahaha! You are obviously NOT a Nutrition student. And at those prices, it seems you bought it at the airport? => Now, I'm not "judging" your choice of food, just your rating of the healthiness of it. It actually looks pretty good. I would have STARTED with the brownie, though. I miss so much brazilian food !!! Add me to the list of people dismayed by the amount of sugar in CJ's lunch yesterday, I'm afraid. The "multigrain" chips may, at first, seem healthy because they're multigrain, but the sugar sprinkled on them pretty much cancels out any benefits of the multigrain. I didn't see anything on the packet that said they were baked, so I assume they were fried. Which means they're rather high-fat. Cherry Coke is NOT "low cal." It is mostly sugar. I know you said you didn't drink it, CJ, but it's in the picture of your "lunch" so I feel obliged to count it. The brownie is also pretty much just fat and sugar. Based on the photo, it's about the same size as the fruit salad, which is a HUGE portion for "one serving." I strongly suspect that the "yogurt dressing" also had sugar as an ingredient. 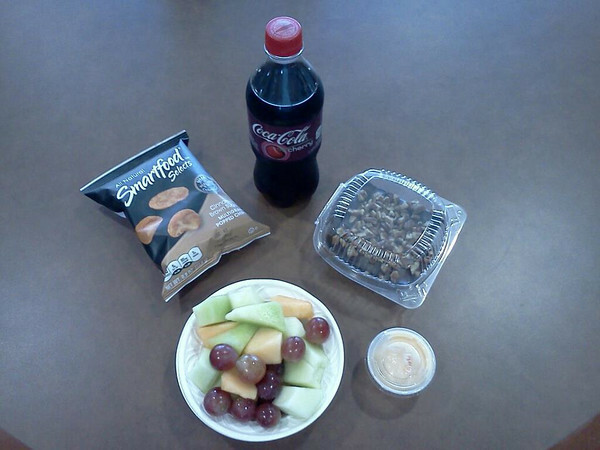 So, really, the only "healthy" thing in the whole lunch was the fruit salad. For the Cherry Coke, the calories would be 260, and the sugar is 70 grams. At 12.6 grams in a tablespoon of sugar, just the chips and the soda are already 6 TABLEspoons of pure sugar in this lunch. That's slightly more than 1/3 cup! That doesn't include the "brownie with fudge icing", any sugar in the yogurt dressing, or even the "natural" sugars in the fruit. I honestly don't mean to sound like I'm picking on you darling CJ, but I think you've provided an absolutely excellent example of how people can *think* foods are healthy when they are actually anything but! In this case, I think the "multigrain" on the chips are seriously misleading. As I mentioned, yes, multigrains are better for you than refined white carbs. But then they'd fried them and sprinkled them with a bunch of sugar. So just because a package says "multigrain" on it, doesn't automatically mean it's healthy. And while fruit is good and most people don't eat enough fresh fruit in their diet, we need to keep in mind that fruit is filled with natural sugars. The fact that the sugars may be naturally occuring doesn't negate the fact that they're sugars. As Sophie Pither said above, the fruit would have made a good sweet (or, as we'd call it, dessert). So, essentially, what I see in your "lunch" is four desserts. Which would prompt me to give it a health rating of 1. Since you ended up drinking water instead of the Cherry Coke, I'll give it a 2. Barely. Again, I don't mean to sound like I'm being mean to you. I think you've provided us a very valuable lesson in this blog, and am grateful to you for doing so. Hi again! I am posting again- though I posted a bit earlier. I have to agree with the critical comments about the quality of the food. I spent 5 years attending Texas Tech and I know how hard it is to find a healthy meal! However, it's possible with the salad bars and new healthier options. Unfortunately, it doesn't seem like CJ is making use of the healthy options, or she doesn't know what is really nutritious on campus! The smoothie place offers protein shakes for more nutrition (best used after a work out!) and many Student Union eateries have healthy options. I am a vegetarian and paid extra attention to nutrition during my time at Texas Tech, so I know it's possible to get good protein filled meals. It definitely is expensive, but if you're stuck at school for 8 hours and didn't pack a lunch it's all you've got! If you read the bag, you can see that the chips are "popped" which means they are NOT fried, and they are whole grain, for whatever that's worth. I'm sincerely not sure how this lunch is any worse than potato croquettes and a sad burger. That's still really carb heavy. Obviously, nobody should eat that much brownie in a sitting, but she didn't, so. Of course this isn't perfect, and highlights how hard it is to find healthy options in the US (and they are really expensive, too) but I'm shocked at how judgmental this became. Of course soda is bad for you. But juice is equally sugary.